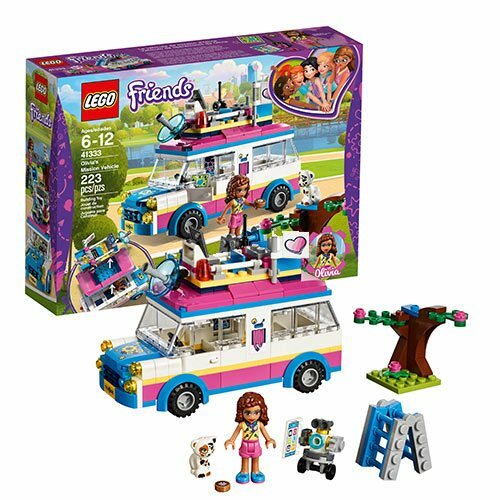 LEGO Friends Olivia's Mission Vehicle comes with an Olivia mini-doll, a buildable Zobo figure and a cat figure, and there is room to fit all 5 girls from Heartlake City inside this popular kids' toy! Discover the secret compartment under Zobo's control center with a map of Heartlake City Park. Use the satellite to find people who need help and put up the ladder to help rescue the cat from the tree. The LEGO Friends 41333 Olivia's Mission Vehicle includes 223 pieces. Ages 6 and up.